Far east nightbird's pop'n music banner. A long version of Far east nightbird appears on the jubeat knit APPEND ORIGINAL SOUNDTRACK. The same long version later appeared on 猫叉Master's second album さよなら世界. A dubstep remix of Far east nightbird by kors k, titled Far east nightbird kors k Remix, can be downloaded by those who bought the complete set of the REFLEC BEAT colette ORIGINAL SOUNDTRACK VOL.1, beatmania IIDX 20 tricoro ORIGINAL SOUNDTRACK Vol.1 and 猫叉Master's Crevice albums. It can also be downloaded by those who bought the complete set of Naoyuki Sato's BEMANI albums (Raindrops, Backdrops, さよなら世界 and Crevice). A short version of Far east nightbird kors k Remix, titled Far east nightbird kors k Remix -DDR edit ver-, appears in DanceDanceRevolution A. 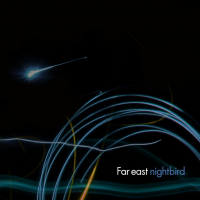 A sequel to Far east nightbird, titled nightbird lost wing, appears in DanceDanceRevolution (2013). Lost wing at.0, from BeatStream アニムトライヴ, is also related to both songs. The melody for the song select BGM for beatmania IIDX 22 PENDUAL's Chrono Seeker event is very similar to Far east nightbird. Far east nightbird is the fifth unlock available in the Crimson shirt class in jubeat knit and its APPEND version. The song may be unlocked for 8 Wool (21 total Crimson Wool). Far east nightbird is one of four new songs in jubeat knit rated a Level 10 on EXTREME, and the first song from 猫叉Master to be rated a Level 10 on EXTREME. Far east nightbird is the only KONAMI original song from jubeat knit composed by an in-house BEMANI artist that has not been removed at some point in the arcade series. Far east nightbird is one of the Lincle LINK 2 songs added to beatmania IIDX 19 Lincle as a default song. Also, Far east nightbird is one of the 3 new songs in beatmania IIDX 19 Lincle with a BEGINNER chart, along with the other Lincle LINK 2 songs I'm so Happy and Snow Goose. Far east nightbird could be unlocked in pop'n music Sunny Park since December 26th, 2012 until April 8th, 2013, by playing 2 credits. As of pop'n music うさぎと猫と少年の夢, it is available by default. Far east nightbird is one of DanceDanceRevolution A's EXTRA SAVIOR 猫叉Master VS kors k songs. It can be unlocked from September 29th, 2016. Far east nightbird is available in beatmania IIDX INFINITAS as part of the beatmania IIDX INFINITAS 楽曲パック vol.1. This page was last edited on 9 April 2019, at 16:39.